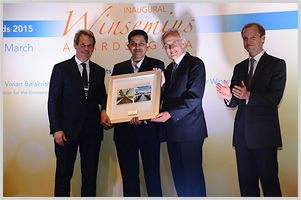 Singapore - April 3, 2015 - eG Innovations, an award-winning provider of intelligent performance monitoring solutions for cloud, physical and virtual environments, today announced that the Dutch Chamber of Commerce Singapore selected eG Innovations as the winner of the Winsemius Award in the SME Rising Star category. The Award recognized eG Innovations for its exceptional business practices and achievements in the areas associated with business culture and excellence. The Dutch Chamber of Commerce business awards, which celebrate the long-standing commercial ties between the Netherlands and Singapore, are named for long-time economic advisor to Singapore, Dr. Albert Winsemius, of the Netherlands. "eG Innovations has a long and positive history of innovation, growth and customer satisfaction. Last year, we established an operation in The Hague, the Netherlands to address opportunities in continental Europe," said Srinivas Ramanathan. "As we continue to expand our solution and geographical footprint, the Winsemius Award stands as an example of the emphasis we place on IP, brand building, internationalization and productivity. We are very proud to be honored by the Dutch Chamber of Commerce Singapore and look forward to continuing our strong presence in Singapore and The Netherlands." eG Innovations is a leading provider of enterprise-class application, virtualization and infrastructure monitoring and management solutions. The company's 100% web-based monitoring solutions are especially suited for mission-critical infrastructures where proactive monitoring, rapid diagnosis and instant recovery are a key. Customers worldwide use eG Innovations solutions to improve the quality of their services, thereby enhancing their competitive positioning, lowering their operational costs and optimizing the usage of their infrastructures. The Dutch Chamber of Commerce, DutchCham was established in 2007. 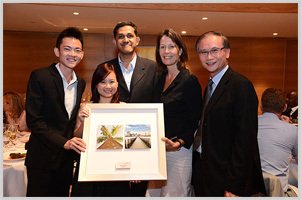 DutchCham is a non-profit organization representing Dutch Business interests in Singapore. It is committed to connecting businesses and creating business opportunities. It also aims to provide a platform for member companies to showcase their particular skills or knowledge in their area of industry to contribute and facilitate aspiring companies to set up their businesses in Singapore. In 2015 DutchCham will focus on the themes of Collaborative Innovation, Sustainability and Water management as these are areas of excellence for the Dutch Business community in Singapore.